The eighth annual Undergraduate Research Symposium is bringing a record 382 student presenters to the Erb Memorial Union Ballroom May 17 to discuss research topics that cover more than 60 majors. 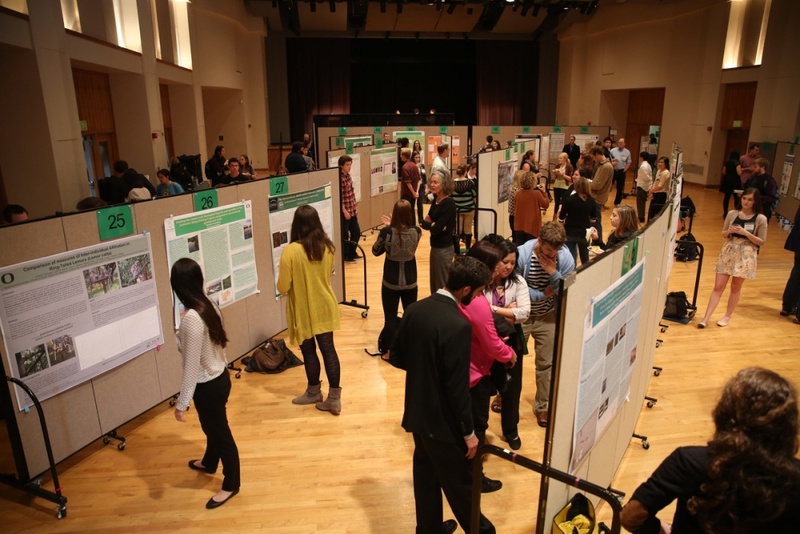 The Undergraduate Research Symposium, hosted every year, showcases UO students’ hard work and research from all areas of study. This year’s symposium will involve oral presentations, awards ceremonies and art displays. “It’s huge. This year it's bigger than it has ever been,” Snodgrass said. Undergraduate research has gained more recognition at the UO recently. This year’s symposium will have close to 100 more student presenters than last year’s research symposium, and it will host an awards ceremony for faculty involved in undergraduate research. The symposium begins at 10 a.m. and will include four, 1½-hour oral presentations on the first and second floors of the EMU. These presentations will consist of undergraduate research topics ranging from television to drug development. Nolan Caballero, a senior majoring in general social sciences and environmental studies, will present a project comparing climate policies and mitigation efforts of small-island developing states. And for its inaugural year, the CURE Mentor Awards, from the UO Center for Undergraduate Research and Engagement, will be given to Judith Eisen, Samantha Hopkins and the Chemical Synthesis Group for their work and involvement with undergraduates. Winners will be given a framed plaque as well as a $2,400 prize. During the awards reception Sravya Radepalli, winner of the Harry S.Truman Scholarship, will give a student keynote presentation. Among the oral presentations throughout the day are two creative work sessions where students and attendees can expect a variety of discussions and presentations, including a translation of cosmologist Carl Sagan's work into song as well as a live dance program. In one of this year’s new events, several UO professors are bringing students together from four different courses to present research on climate change, public lands and environmental justice in a miniconference within the larger research symposium. Students from history, English/environmental studies, earth sciences and political science tackle climate, diversity and justice in different but complementary ways. The more than 60 posters will address critical issues from many perspectives. The student presenters all grappled with climate and justice themes throughout the term and will showcase their multidisciplinary research in the special section of the symposium from 5:30 to 7:30 p.m. in the EMU ballroom. The miniconference is co-sponsored by the Undergraduate Research Symposium and the Robert D. Clark Honors College, Environmental Studies Program, Native American Student Union, Office of the Vice President for Equity and Inclusion, Office of the Provost and Academic Affairs in partnership with the Teaching Engagement Program, UO Fund for Community Engaged Teaching Program, UO Climate Change Research Group, Affiliated Tribes of Northwest Indians and U.S. Forest Service Pacific Northwest Research Station. This event is also part of the Pacific Northwest Tribal Climate Change Project. To learn more about the Undergraduate Research Symposium and to see the wide range of topics being presented, visit the symposium website.